Just one lesson today on adding a new customer to Flobot. Invest just 10 minutes of time to learn this new skill. Take a few moments to look over this screen. It is useful for getting a snap shot of your business on a daily or monthly basis. But don't worry about it too much yet, let's start with the basics. 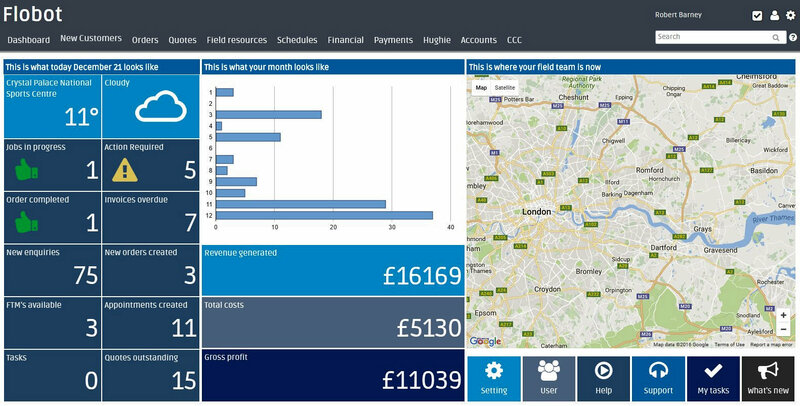 To take a new customer into the system go to the top of the screen navigation and click 'New Customers'. This screen shows what we call the 'to-do' list of new customers. A list of potential customers we haven't got around to dealing with yet - but we don't want to lose them so we have saved them here. Now go to the right hand side of the screen with the 3 little bars. We call this 'The Cabinet'. You will see them all over Flobot. When you do it means there is a drop down menu. Click it and select 'Add a new customer or enquiry'. Note the video symbol. You will find this symbol throughout Flobot. If you get stuck click it and watch the video. It will show you how to do things. Now fill in the customers details. If you are in a hurry because the client is on the phone then you can just get their name and telephone number. Press the 'Save' button and you can come back and fill the rest of the information at a later date. 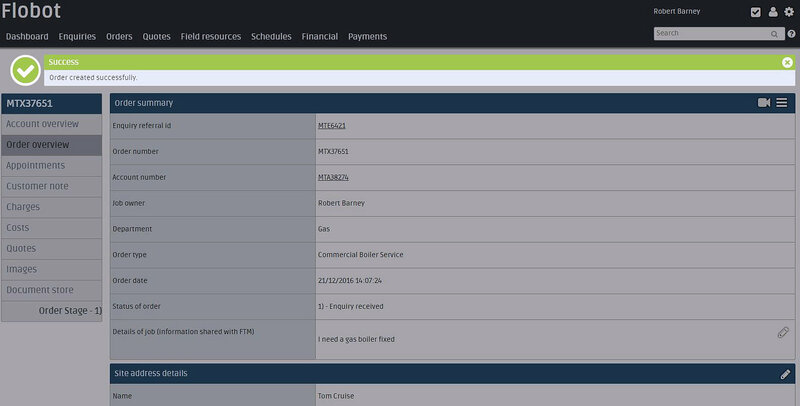 As you can see you can add lots of information in the details box, pictures, files and even video. Once you have the information you need then click 'Convert to order'. You will be taken to the screen above. Click the green pop-up to make it go away. You are now ready to make things happen with this order. But this is tomorrow's lesson. 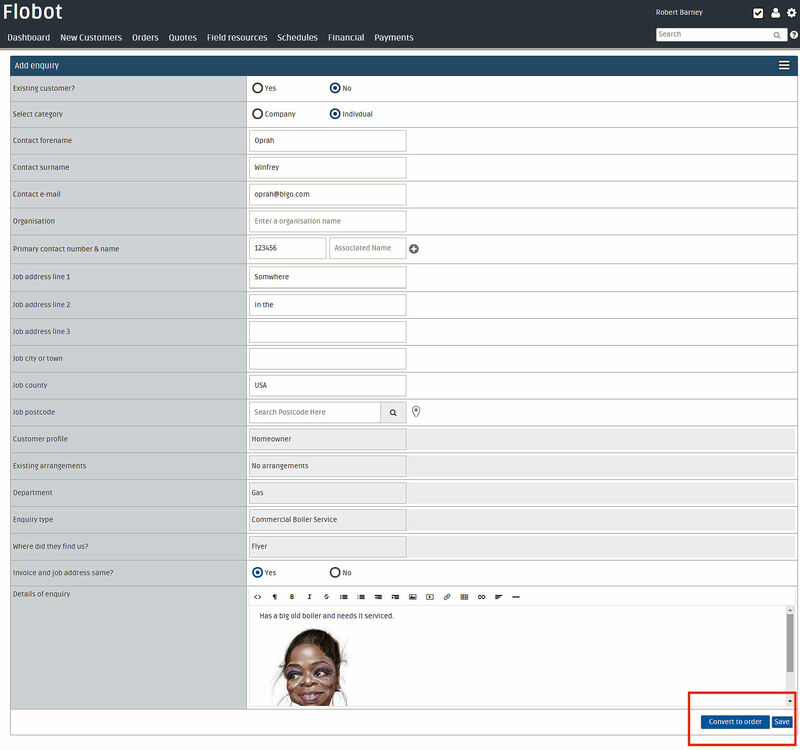 Practice adding new customers to Flobot at least 5 times and use all the variations in the form. For example you can select to add a company instead of a single person. Play around with saving the enquiry and then going back to complete it. Notice that you can also import all your customers via csv file so this is foradding a single new customer. If you get stuck click the video symbol in the top left and you can see a demonstration of how it works. Now stop - first day of school everyone gets to go home early! Get ready for day two of the academy.